U.S. stocks wrapped up a buoyant July, with all three indexes gaining between 4% and 7%. For the Nasdaq, it was the best month of 2013. Yet, the last day of the month was less than stellar. Stocks wobbled a bit Wednesday, after the Federal Reserve left its bond buying program unchanged. At the conclusion of its two-day meeting, the central bank said that the economy appears to be improving, noting that "downside risks" have diminished since last fall. At the same time, the Fed said it would continue its monthly bond purchases to "support a stronger economic recovery." The Fed's stimulus program has been a big driver of the current bull market. Year-to-date, stocks are up 19%, and a pair of better-than-expected economic reports Wednesday kept tapering fears at bay. The Dow Jones Industrial Average ended Wednesday down 0.1%. Earlier, it rose more than 114 points to a new intraday record high. The S&P 500 closed flat, and the Nasdaq gained 0.3%. Ahead of the Fed, the U.S. government released its first estimate of second-quarter GDP, which showed the economy grew at a 1.7% annual rate. That was an improvement over the first quarter's 1.1% annual rate. Separately, payroll processor ADP said the private sector added 200,000 jobs in July, flying high about expectations. ADP numbers are often seen as a precursor to the monthly jobs numbers from the Labor Department due out Friday. Facebook -- don't call it a comeback yet: More than a year after its much-hyped initial public offering, Facebook's (FB) stock finally exceeded its IPO price, albeit briefly. After topped $38 early Wednesday, Facebook's stock ended down more than 2%. Still, Facebook's stock is up nearly 40% since it reported strong earnings last week. Remember Herbalife (HLF)? The most beloved/reviled stock among hedge fund managers got another boost Wednesday after CNBC reported that George Soros' fund had taken a sizeable stake in the nutritional supplement company. 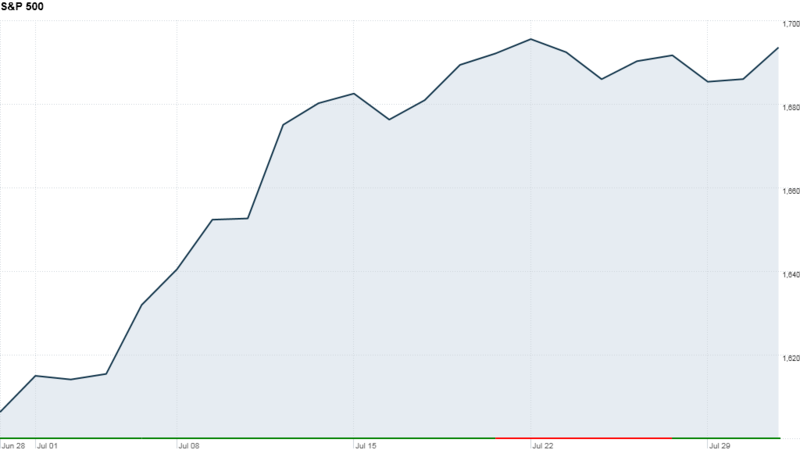 Herbalife's stock had spiked Tuesday after better-than-expected earnings. Other stocks rallying on earnings and revenue beats: Comcast (CMCSA) and MasterCard (MA). Best of StockTwits: On any given day, the chatter on StockTwits centers around high-profile stocks in the news and on the move. Here's a look at some of them. Shares of industrial gas producer Air Products (APD) rose after hedge fund manager Bill Ackman disclosed a 9.8% stake in the company. But Jeff Reeves is not impressed. JeffReevesIP: Who cares if Ackman in $APD? 1. his $JCP & $HLF calls sucked 2. active stock pickers underperform 3. why run w herd? Can't resist tossing in some Herbalife feedback here. After all, the stock did hit a 52-week high today. 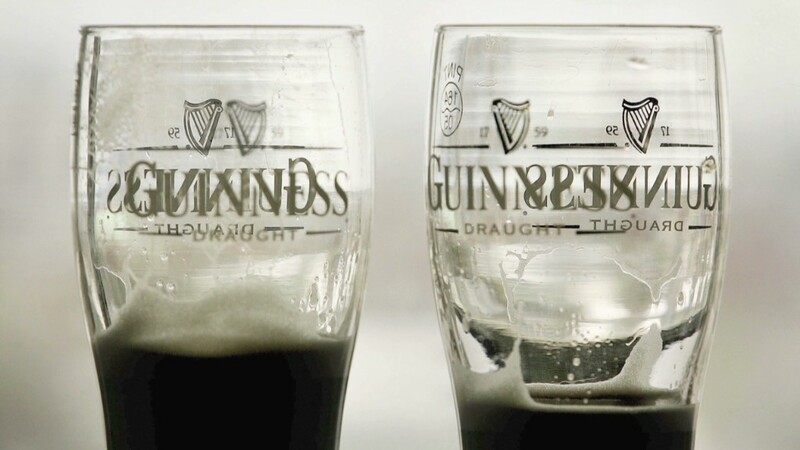 It was also a beverage bonanza Wednesday with both Diageo (DEO), the maker of Johnnie Walker and Guinness, and the maker of the "king of beers" Anheuser Busch (BUD) beating the Street's expectations. SodaStream's (SODA) stock gets bubbly. Shares of the producer of home carbonation machines rose 12%, after SodaStream beat earnings and sales forecasts, and boosted its outlook.